The number 9 relates to completion, fruition, integrity, idealism, the unseen realms, life review, wisdom, crystallisation, transition, the Third Eye, visionary leadership and protection. 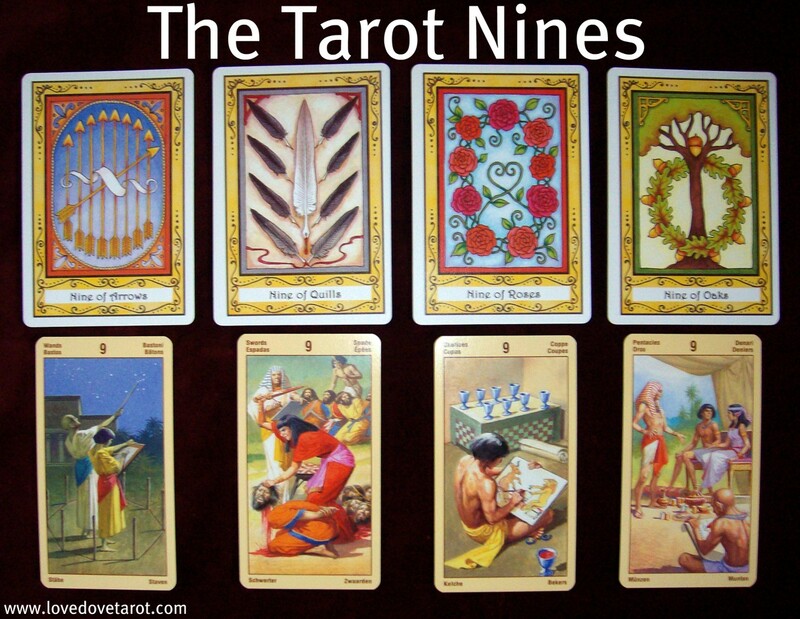 The Tarot 9’s are a bit like the 7’s in that they often indicate solitude rather than companionship. This is by virtue of resonating with the Major Arcana Hermit energies. Energetically, there is a strong resonance with the Third Eye. 9 of Wands. Like the 4 of Pentacles, this is a card of boundaries. Often it indicates a need to draw new boundaries after betrayals and other harsh life lessons. Depending on the spirit with which these lessons are greeted, the person represented by this card can either choose to display sound boundaries or become jaded and cynical which then leads to isolation and an unwillingness to share oneself with others. 9 of Swords. A card of worry, anxiety and despair. This is what I like to call ‘the card of the looping mind.’ The mind starts to loop when we are unwilling or unable to face our own shadow and instead choose to blame others and outer circumstance for our problems. 9 of Cups. A card of great emotional contentment. This card indicates an ability to appreciate the little things in life – a trait which instantly leads to increased happiness. 9 of Pentacles. This is a card of success and achievement in the material realm. It may indicate that you are quite happy in your own skin and actually better off on your own than paired up.